Winter Queen's Jewel is the first of our StitchyBox Presents kits, designed by Ink Circles. Each kit includes the chart, a skein of Winter Queen (our StitchyBox-exclusive colorway from Gentle Art Sampler Threads) and crystals to help your Jewel bling. Winter Queen's Jewel can be stitched in a variety of ways on any fabric you choose - she's gorgeous over 1 or over 2, with crystals or without. Our pillow model was stitched on 40 count Providence linen from Fabric Flair (1 over 2), using Ink Circle's Silk Sequencing technique, and was finished using a variation on Ink Circle's Self-Backing Diamond finishing method. Our scissor fob model was stitched on 28 count Pewter opalescent linen from Picture This Plus (1 over 1), stitching from top to bottom, and was finished by whipstitching a corresponding piece of linen on the back to the front piece. We'd love to see your Winter Queen's Jewels! 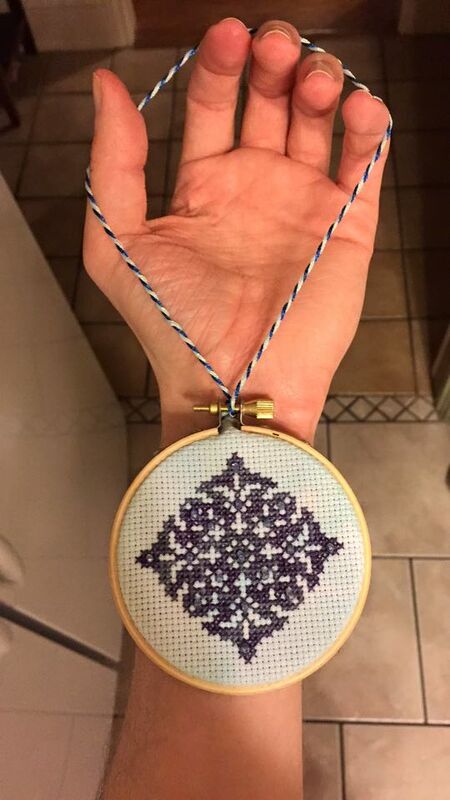 Please use #winterqueensjewel when posting photos of your WIPs and finishes so we can check them out. Happy Stitching!